Among vegans and vegetarians, there are those who choose to do so simply because they prefer it – they do not like to eat meat. And that’s perfectly fine. However, a lot more people who will say that they are on such a diet decided to stop eating meat for the love of animals, compassion, and in order to stop the killing. This second group is totally wrong and their reasoning is less logical. It will be surprising, but not only that they participate in the killing of animals just like omnivores do, they even harm animal life more than the meat eaters. At least that’s what claims Claudio Bertonatti, one of the most famous Argentinian naturalists, people who have dedicated their lives to nature. In his article “The vegan misconceptions” he warned the readers why by eating vegetables you still support the killing of animals. This drew the anger of thousands of vegans and vegetarians, but also their colleagues who deal with environmental protection. However, if you listen to his arguments carefully, you must admit that they make some sense. “I was an ardent vegetarian. As a teenager, I grew up in connection and love for nature. I thought I could avoid killing many animals if I become a vegetarian. Later I studied that topic a little better, I went into the wilderness and studied the local vegetable-animal world and then I changed my mind, ” explains Bertonatti in an interview for Playground.plus. “In Argentina, many think they are fighting for the animals if they do not eat meat or wear leather clothes. They think, if there were more vegetarians in the world, fewer animals will be killed. This is not true. From the moment humans began to cultivate cereals and work in the fields, it has already made an impact on nature and especially the wildlife. There are no animal species that is not connected to the system, the survival of some depends on death, whether directly or indirectly. I understand that this knowledge can be painful. I’d like to live in an ideal world,” he explains. “When I say this, many feel under attack. Rice, corn, pastry … most vegetarians eat it. The first impact of such foods production is the loss of forests. We are forcing nature to make room for crops. Many rainforests around the globe disappeared due to wheat and corn fields. And we continue destroying the nature by preventing the birds to feed. Many farmers use poisons against these birds. For other animals, they put electric fences or scare them away with guns. So, if you eat meat, you participate in killing animals. But if you eat vegetables, again you participate in the killing of animals. But this time, you are helping in killing the wild animals. “Most of us who live in cities, do not know enough about animal life. Many do not know to name more than 10 animal species. We all know the cows, pigs, horses, goats … And there our interest ceases. It seems like we simply do not care to know more about wild animals. 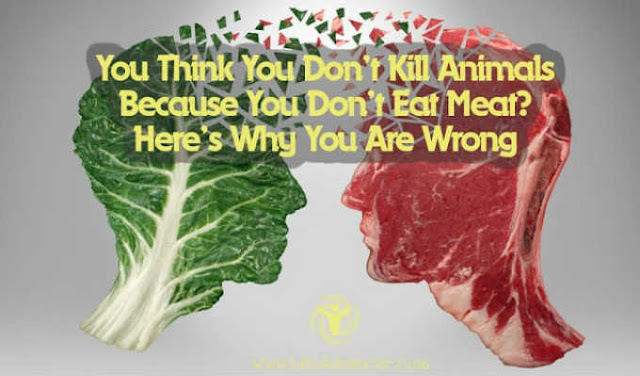 But anyway, for vegans who swear that they switched to this kind of eating to prevent violence against animals, is simply philosophically inconsistent – says Bertonatti.